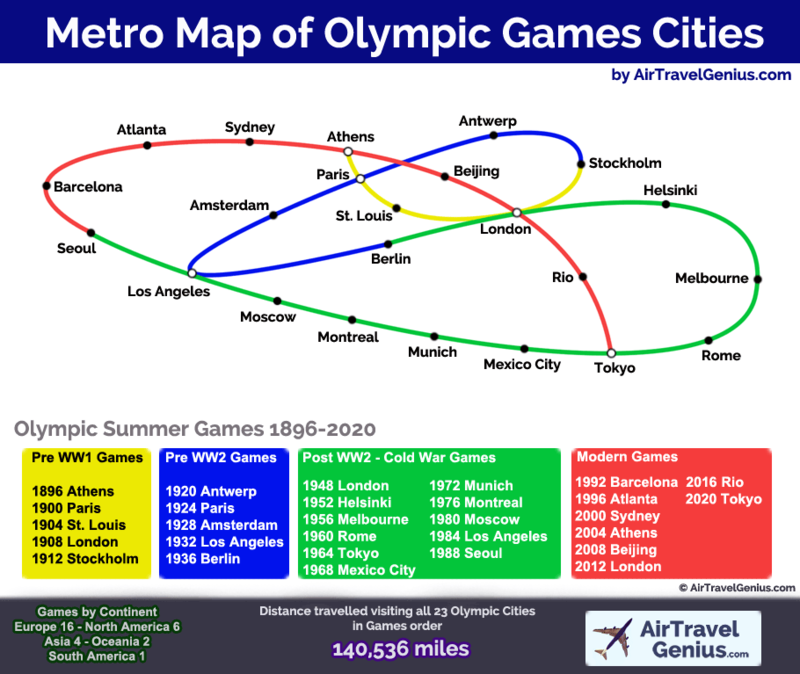 This metro-style map shows the host cities of the Olympic summer Games in chronological order from 1896 to 2020. A journey from Athens to Rio and Tokyo taking in all 23 Olympic cities. We have grouped the Games into 4 colour-coded time periods to make it easier to follow on the map. These are the same colours that are used in the Olympic rings. 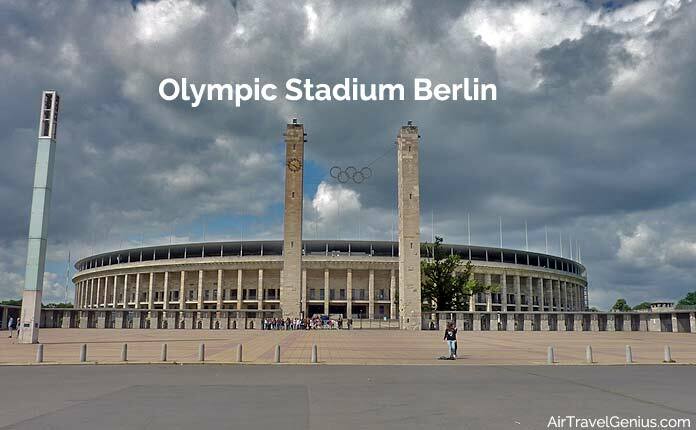 Note that no Games were held in 1916, 1940 and 1944 – these were scheduled to be hosted by Berlin, Tokyo and London respectively, but had to be cancelled due to hostilities. Green marks the post-War Games held during the era of the Iron Curtain and Cold War – up to fall of the Berlin Wall in 1989. Things came to a head between the Soviet Union and USA in Moscow 1980 and in Los Angeles 1984 when they boycotted each other’s Games. Below are some facts and figures, a mash-up of Olympic geography, aviation and sport. We note that airplanes had not yet been invented during the first 2 Olympics in Athens 1896 and Paris 1900! In those days competitors would have arrived by ship or train. The Wright brothers first flew near Kitty Hawk, North Carolina, USA in December 1903. Others claim that Kiwi Richard Pearse flew the first ever flight in Waitohi, New Zealand in March 1902! If you wanted to visit all the Olympic Games cities in chronological order as seen on our map you would need to travel 140,536 miles. This includes the multiple visits to Athens, Paris, London, Los Angeles and Tokyo and travelling across the globe in a zig-zag fashion. The total distance would nearly 6 times around the world or 59% of the way to the moon. It would be possible to visit all 23 Olympic Cities once with considerably less mileage required. This could be done by flying on a Round-The-World air ticket (which has a maximum of 16 segments) and taking a few side trips to make up the 23 cities. We would advise train travel between the likes of London, Paris, Antwerp and Amsterdam. Rio 2014 marks the first time the Olympic Games have reached the South American continent. A flight today from Paris to Rio takes about 11 hours. However between 1976 and 1982 Air France operated a Concorde flight between Paris and Rio. Whilst a fuel stop was needed along the way in Dakar, Senegal, the total flying time was only 5 hours 52 minutes. This flight was featured in the James Bond film Moonraker with Roger Moore arriving on Concorde at Rio airport. As a sidenote, the 10 Olympic cities which have featured in James Bond films are: Amsterdam, Berlin, Los Angeles, London, Mexico City, Moscow, Paris, Rio, Rome and Tokyo. We mentioned the Olympic Long Jump record of 8.90m (29 ft. 2½ inches in old money) by Bob Beamon of USA. Set on 18 October 1968, he literally flew out of the pit in the thin air of Mexico City. Beamon would need just over 8 of his jumps to clear the length of an Airbus A380 Superjumbo! The Olympic record still stands today – Carl Lewis who won 4 consecutive Olympic Long Jump Golds managed a best of 8.72m in Seoul 1988 – although at Mexico City altitude that would probably equate to a jump of over 9 metres. Beamon’s world record was finally broken by Mike Powell with 8.95m at the Tokyo 1991 World Athletics championships. Carl Lewis jumped a wind assisted 8.91m on that day as well. This is a slightly controversial list and we do note (for example) that Colombian airline Avianca was founded in December 1919 as “SCADTA” 2 months after KLM. It only became known as Avianca in 1940. For many years Greece’s national airline was Olympic Airways which was founded in 1957. It still runs to this day as Olympic Air, albeit as a regional subsidiary of Aegean Airways. Keeping with the Rio theme, the first international airline ever to land at London Heathrow was a Brazilian Panair flight from Rio. Using a Lockheed 049 Constellation, the plane made stops in Recife, Dakar, Lisbon and Paris before reaching London. And now the world descends on Rio for the opening of the 28th Summer Games. Good luck to the competitors and safe travels to all.